A major problem that enterprises are facing is that extensive time and effort are required to align enterprise applications and WebLogic servers for optimum performance. Because performance tuning is so complex, many enterprises are running WebLogic with configurations that are not fully optimal. Applicare changes WebLogic tuning from an extremely complex task to one that entails just a few clicks. Applicare automates the proven WebLogic tuning process using its IntelliTune technology built upon Applicare's inherent knowledge and decision-making capabilities. With Applicare, the process of tuning WebLogic remains the same – except that Applicare does all of the work of running loads, analyzing performance, making appropriate changes and restarting the WebLogic server whenever needed. Applicare uses a user-provided load-generation script and runs various scenarios on the WebLogic application. It analyzes the application and WebLogic behavior during each load. At the end of each load and analysis, Applicare makes appropriate adjustments to the correct tunables. After adjustments it reruns the load and compares. It follows this process until a perfect balance is achieved. 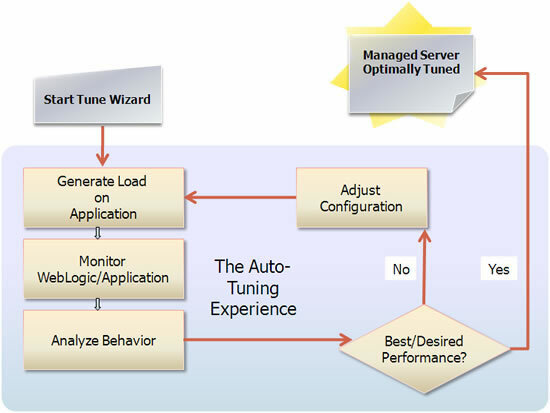 During the tuning process Applicare identifies any application bottlenecks. You can start the WebLogic tuning process before you leave for the evening and the next morning you get a perfectly tuned WebLogic. Your involvement in the whole tuning process is needed only during the kickoff. Applicare Tune Wizard simplifies the kickoff process to just a few clicks. You can also schedule the kickoff to start tuning at night (or any other time) as needed. If a problem occurs during the tuning process, Applicare will inform you by e-mail. At the end of the tuning, you can view the performance impact using Applicare Tuning Analyzers. You get the before and after pictures to compare the results of each tuning. Since Applicare tunes and detects problems at the WebLogic-engine level, it helps the whole suite of products based on the WebLogic server. AutoTuning automates capacity determination and takes the guesswork out of sizing the application environment. "Applicare simplifies laborious and time consuming process of tuning WebLogic down to just a couple of clicks. In addition to its auto tuning capabilities, Applicare provides simple and efficient tools for monitoring WebLogic. With the best-practices knowledge that is embedded in Advisor and its root cause analysis capabilities, Applicare can help customers get a lot more out of their investment."